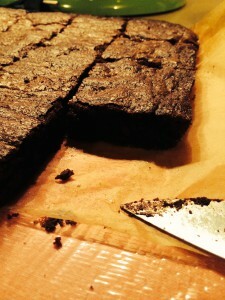 It was time to bake something sweet, so I settled on brownies. My usual recipe is one from Recchiuti made with melted unsweetened chocolate. But I uncovered some Callebaut cocoa that had been in the back of a cupboard for way too long, and decided to find something to use it in. Hence, Mexican Brownies, courtesy of Aaron Sanchez from the Food Network. They’re spiced with cinnamon and cayenne pepper. I also added a teaspoon of espresso powder to boost the chocolate flavor, used white whole wheat flour instead of all-purpose, and added a half-cup of bittersweet chocolate chunks because I could. I was reluctant to bake with cocoa because I assumed the flavor would be weak. But these brownies are really good. Different flavor because of the spices, with the cayenne pepper adding just a touch of bite. I added the 1/4 tsp that the recipe stated, but if you like really spicy chocolate, you could add 1/2 tsp. Or as much as you wanted, because you have thumbs.